With five separate function areas to choose from, we decided to take advantage of the cool night air and sat on the picturesque front terrace. The restaurant was quiet, which allowed for the friendly Khmer waitstaff to be very attentive, and even apologetic at the lack of ingredients for fruit shakes. Having already perused the menu from the comfort of home, I had a pretty good idea of what I was going to choose, but my companion for the evening was a little indecisive in choosing a main course. We decided to order a plate of pan fried salt and pepper calamari to share as an entrée. Cooked in olive oil and served with a wonderful rocket salad in a crispy rice paper bowl, these were just how good calamari should be: slightly chewy and full of flavour while avoiding being overpowering. The accompanying salad was light and dressed perfectly. This has to be one of my favourite starters to date. To the main show and time to see what all the excitement was about. 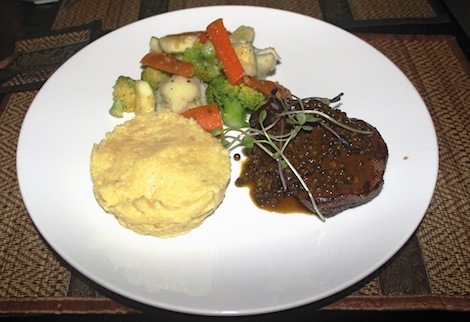 I plumped (and after this meal, “plumped” is the right word) for the Australian grass-fed tenderloin, served with mashed potatoes and vegetables and a Kampot pepper sauce. To say the steak had me convulsing in paroxysms (there you go, ed.) of carnivorous delight would possibly be the understatement of the year. This truly was a steak cooked to perfection. Full of taste, juicy and complemented by the Kampot pepper sauce, I can’t recall a finer bit of beef since arriving in Cambodia. The mashed potato could have been cooked slightly better, but this was a small gripe when compared to the impeccable meat and vegetables. I was hoping that the sidekick would also choose something from the carnivore’s cornucopia of beef but, crying lack of appetite, she settled for the chicken and avocado sandwich, served on toasted homemade bread with cheese and mayonnaise with hand cut fries. While this is something I’d more choose for lunch rather than dinner, I do have to say that this is one of the better sandwiches I’ve sampled in the ‘Penh. The homemade bread was light and tasty with none of the doughiness you often find. The combination of fillings was extensive, leaving a smile of gastronomic satisfaction on both our faces. While I wouldn’t dwell on talking about fries too often, these were, again, some of the nicest I have yet to eat here. Starters range from $4 to $5, and mains from $4 (for the sandwich) to $20 for a 300g T-Bone. The menu also features seafood, lamb and pasta. Definitely not the venue of choice for all you lettuce munchers out there, but if you’re a red meat loving carnivore like me then Black Salt has to go on your “must-visit” list.